One of the biggest mysteries with regards to JFK's assassination are the differing accounts of the head wound. 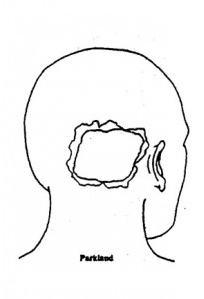 Image 1 (below left) is a drawing depicting JFK's head wound as seen and described by 26 medical personnel who worked on the JFK at Parkland Hospital, in Dallas. All stated the wound was an exit wound, about the size of an egg. Being an exit wound means the bullet had to have come from a location in front of JFK, not from the 6th floor of the TSBD, which was behind him. 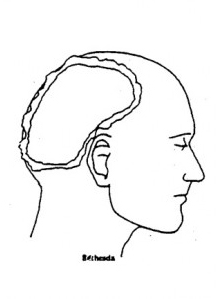 In image 2 (below center), we see the head wound as seen and described by medical personnel and FBI agents who attended the official autopsy at the Bethesda Naval Hospital. The wound was now four times larger than what was seen when JFK's body left Dallas. 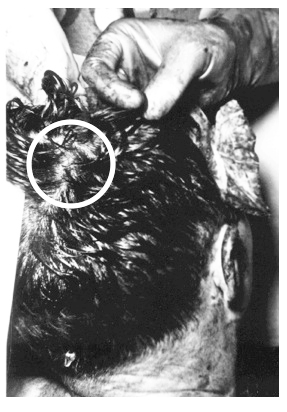 And in image 3 (below right), we have an official autopsy photo that shows a tiny bullet wound to the back of JFK's head. Clearly, something is fishy here. But wait, two additional photographs of JFK's head are shown below. Notice the length of JFK's hair compared to its length in the Warren Commission photograph (image 3). The President's hair was short and well kept in image 3, while images 4 and 5 show his hair longer and matted with mucky matter. Gunn: No cleaning, no combing of the hair or anything of that sort? If you're thoroughly confused at this point, just wait... there's more. The day after the assassination a man named Bill Harper was walking through through Dealey Plaza when he discovered a piece of skull that has since come to be known as the "Harper Fragment". The Harper Fragment was nearly 3 inches in length. 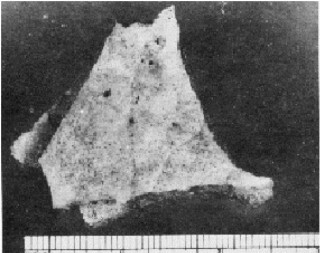 The only person who suffered a head wound in Dealey Plaza was JFK, so it's safe to say this fragment must have come from JFK's skull. Yet, if we look at the Warren Commission photo (image 3), there's no area on the back of his head where a 3 inch fragment could come from. 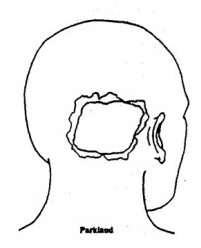 But if we look at the wound, as seen and described by the medical personnel at Parkland Hospital (image 1), this piece of skull could easily be associated with that depiction of JFK's head wound. Click here to watch a short video where Bill Harper describes finding the piece of JFK's skull. Entrance Wound or Exit Wound? 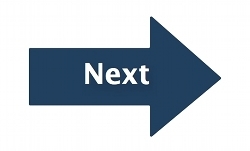 For those not be familiar with gunshot wounds, a wound of entrance will typically be much smaller than the wound created when the bullet exits a body. That being the case, JFK's head wound couldn't possibly have been an entrance wound, even though that is what the Warren Commission would have us believe. At the time of the assassination, JFK had his back to the Texas School Book Depository, which is where Lee Harvey Oswald is alleged to have fired three shots, including the fatal head shot. Dr. Charles Crenshaw, one the doctors who treated JFK at Parkland Hospital, states unequivocally that the wound to the back of JFK's head was an exit wound and that the second wound, the wound to JFK's throat, was a wound of entrance, proving that neither shot could not have come from the sixth floor of the Texas School Book Depository.